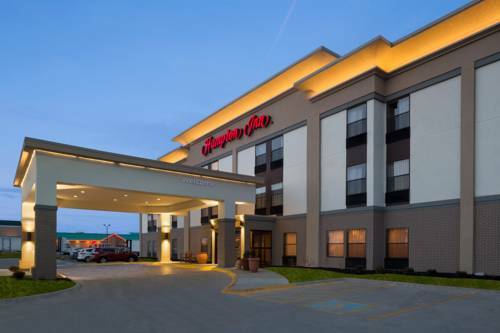 The Hampton Inn Findlay hotel in Ohio is located on the corner of Interstate 75 and State Route 224 in the northwest part of town just two miles from downtown Findlay. Area attractions near this Findlay Ohio hotel include the Hancock County Historical Museum Findlay Shopping Mall with over 50 stores University of Findlay Marathon Diamonds Emory Adams Soccer Fields and Riverside Park. Within walking distance of the Findlay Ohio Hampton Inn hotel are Carmike Cinemas Outback Steak House and Beer Barrel and Cracker Barrel. A variety of other restaurants are just a few miles away. Sure to please the busy executive or leisure traveler Findlay Hampton Inn hotel guests enjoy a free hot breakfast buffet served daily and on Monday through Friday complimentary On the Run breakfast bags and a digital USA Today newspaper. Guests staying at the Findlay Ohio Hampton Inn enjoy the convenience of complimentary wireless high-speed internet in the rooms hotel lobby and all public areas as well as coffee and tea 24 hours a day in the hotel lobby. The Findlay Ohio Hampton Inn offers an indoor hotel swimming pool that is open year round which is an ideal leisure activity for families and business travelers or guests can exercise by using the outdoor jogging track or on-site fitness facility. Located within walking distance of hotel. At Cracker Barrel Old Country Store it*s always been about pleasing people. We*re known for doing things a bit differently and there*s good reason for it. .50 miles from hotel. A casual dining experience that everyone in the family is going to love. Features an extensive menu of soups salads sandwiches subs pizza and award winning entrees. Animated dead animals, Public Enemy #1, and a collection of objects swallowed and removed by a doctor -- all in one unusual county museum. A Michigan cement tycoon hired Mexican artists to build bridges on his estate out of concrete that looked like wood.